The Danish course has graduated out of beta! Congratulations to all involved for their hard work! That was quick indeed! And German for French has entered the incubator! Welcome to the team. This team has started with a bang. They already show 26% progress, however I have discounted their initial boost of 13% upon entry. With an effective progress of 13%, they are the Leader Extraordinaire this week. Well, we continue to have as many as 18 courses making progress in Phase 1 and the overall progress number is 3.33%. It has been several weeks since we saw this number above 3%. You will find several welcome messages in various course updates below. I really like to see these. They continue to remind us that the incubator community is a very well-knit one and is growing and is playing a key role in Duo's success! ^ The Turkish, the Hungarian, & the Russian teams' progress is as per their own calculation. Mission accomplie : nous sommes sortis de la phase Beta ! Nach viel Arbeitsschweiß, unzähligen Stunden Arbeit im Incubator (vielen Dank für Eure Satzvorschläge) und regem Austausch in unserer "équipe franco-allemande" dürfen wir Euch nun feierlich verkünden, dass wir die Betaphase hinter uns haben und im Kreis der stabilen Kurse bei Duolingo sind! Dabei arbeiten wir weiterhin an Euren Verbesserungsvorschlägen und wollen den Kurs weiter vorantreiben. Mit knapp 300.000 Kursteilnehmern kommen viele wertvolle Vorschläge von Eurer Seite! Wir arbeiten momentan nicht nur an der schrittweisen Integration der bereits angekündigten Grammatikhinweise für weitere Lektionen, sondern wollen in naher Zukunt ebenfalls den Kurs "Deutsch für Französischsprachige" in Angriff nehmen. Today our team got our first new member: luke51991. Give him a warm welcome! We have new members ! I want to introduce Sidrane and Sofia, the first girls in our team! I'm excited to see their work here !!! L'équipe FR-IT cherche des collaborateurs ! Bonjour à tous les francophones et les italophones ! Nous cherchons des collaborateurs pour notre cours de Français/Italien. Si tu parles les deux langues, nous aimerions que tu poses ta candidature. Si tu aimes les languages et Duolingo et tu as envie d'aider les autres personnes à apprendre et à communiquer, vas dans l'Incubateur et écris pourquoi tu voudrais collaborer avec nous. Nous avons hâte de lire ta candidature! Tu peux cliquer ici pour aller directement au formulaire de candidature. Number of completed words: 1843. Still working on Chapter 9 (out of 10). Thanks for your anticipation, and please bear with us! TL;DR Several courses in Phase 1 making great progress. Overall progress was 3.33% last week. The next update is expected on Sunday, 15th of February at 4:00 pm UTC. Me too! I'm confused about the progress: 95% or 70% ?! 70% :) Don't trust the calculator! Can you even imagine the elation and joy on the part of the users waiting, and the elation and joy on the part of Selcen, Alex, et al (from not having to explain it for the nth time) when Turkish is -actually- at 95%? I think people might explode from excitement. Glad to see Eo is climbing steadily! Me too! I wish I had the ability to help them go faster cause I reeeeally want to get stuck in. I love the sound of that. :) I am trying to get as much head start as I can while I have been somewhat patiently waiting for the EO course. Mi estas tre ekscitita por la proksima semajno! Mi ne povis atendi, kaj mi estas studado kun la komputilan programo, "Kurso de Esperanto," ĝis via kurso sur Duolingo estas preta! Mi estas tre ekscitita por la venonta semajno! Mi ne povas atendi, kaj mi studas per la komputila programo, "Kurso de Esperanto", ĝis kiam via kurso ĉe Duolingo estas preta! "mi estas studado" = I am the act of studying. It's usually best to just simply say the simple "Mi studas." If you really want to emphasize that you're currently studying, then you can stay "Mi estas studanta." or more simply "Mi studantas." Pardonu min, sed kial "venonta?'' Kaj, kial ne "studado?" Mi kredas, kial "per" kaj "ĉe." Sed la aliaj? Se mi estas lerni, mi devas kompreni. Go Hungarian! and also Turkish! and Russian! and Polish! and Esperanto! and Norwegian! Dedication is difficult ;) I am rooting for the same teams as well! FYI there was an AMA on reddit a few days ago for one of the guys building the Norwegian course. I don't know the link to it though. I was traveling this weekend in the amazing town of Bursa, so I didn't see this until Selcen sent it to me. Get ready!!!! We have a (hopefully) good course ahead of us! Oh, good!! We are ready!!! :D I'm sure it will be amazing!!! JP>EN course got four new contributors. They might graduate from beta soon (yet I think it will still take months). There are even more "Welcome" messages for the contributors now! Also from my part much appreciation to jitengore for these regular updates. They are something I very much look forward to every week. We're doing our best! :) There are several difficulty in planning the course but it shouldn't be a permanent issue. Looks like their progress today had a nice bump, after this report, to 5.6%. Polish course still with zero progress, really sad to see it as a Polish. One of my co-workers is Polish and is interested. He has recently joined (as in started) Duolingo and might be in a position to help the Polish team. Yeah, I was also applying for the course creating but it seems that my qualifications are not enough (just a high school student, I understand it). Yeah, I wish it would be due for sooner. I know some Polish people who are bilingual, so maybe I can see if they would be interested. I really want to learn Polish because it is such a beautiful country. I really want to learn Polish too. I do have a friend who I think is pretty much bilingual in Polish and English so I might see if she's interested in helping the team out. If you or anyone else have any learning questions you can ask me here on Duolingo, I'll do my best to help you and perhaps reasonable would be creating in the discussion section a topic with questions & answers for learners of Polish. Oh man, so many great languages coming up. After finishing my Spanish tree now I want to do all of them. Every last one of them. Added your new edits, Bruno_de_Brito. Thank you so much for the update! Very exciting to see the teams's progress, as every week. Great update as always, thanks jitengore! Go Team Russia! I'm glad to see progress. Ukrainian all the way !! Good job guys. So proud to see Vietnamese up there. It's the first Asian language for English speakers started here! So exciting! I am really hoping Korean follows shortly!!! Yeah Korean! That's the only language I might actually be in a position to contribute. :) Also it would be cool to see some of the other big ones, like Chinese and Japanese (I'd really look forward to that). Although there are already quite a number of languages here already, and some that are planned to enter the incubator soon. So anyway, if you have a basic question about Korean I'd be happy to try and answer it for you. 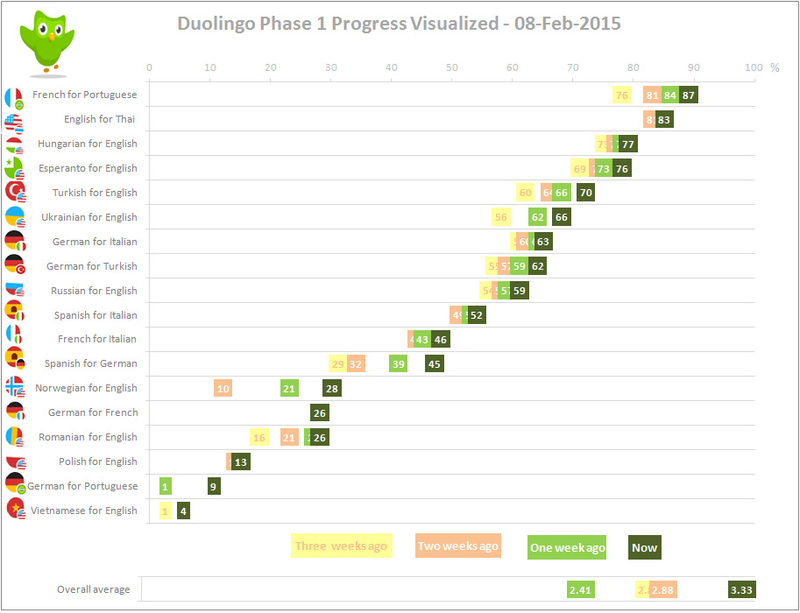 Wow, Norwegian and Esperanto are both powering on, significant progress just in the last two days! One question, though. I met a Norwegian woman a month ago who told me Swedish was almost the same language entirely as Norwegian. How close are the languages? Are they as close as say, Spanish and Portuguese, or even more similar? You can make an argument that Swedish, Norwegian and Danish are dialects of one language. Wikipedia has an interesting section on it here. Team Turkish for the win. GO, GO, GO! VIETNAMESE! VIETNAMESE!